2005-09-22 Assigned to HALLIBURTON ENERGY SERVICES, INC. reassignment HALLIBURTON ENERGY SERVICES, INC. ASSIGNMENT OF ASSIGNORS INTEREST (SEE DOCUMENT FOR DETAILS). Assignors: FUNKHOUSER, GARY P., SAINI, RAJESH K.
The present invention is related to co-pending U.S. application Ser. No. 11/232,687 entitled “Orthoester-Based Surfactants and Associated Methods,” filed on Sep. 22, 2005, the entire disclosure of which is incorporated herein by reference. While a variety of surfactants have been used in subterranean applications, problems have been associated with their use. For instance, certain surfactants used heretofore may have undesirable environmental characteristics and/or may be limited by strict environmental regulations in certain areas of the world. Thus, degradable surfactants have been used to reduce the potential for bioaccumulation and/or persistence of such surfactants in the environment. Currently available degradable surfactants, such as esters, amides, and acetals, have characteristics that may limit their usefulness in subterranean applications. For instance, esters and amides may not degrade as desired in conditions that may be encountered downhole. Further, degradation of esters and amides is slowest at pHs encountered in the subterranean environment, and thus may result in unacceptably long persistence times. Likewise, problems also may be encountered with the use of acetals in subterranean applications. While acetals are usually stable at high pH values (e.g., >about 6), low pH values (e.g., about 1-4) may be required for their degradation to occur at desirable rates. This typically requires exposure of the surfactant to an acid to facilitate the degradation thereof after introduction into the subterranean formation, which may add undesired expense and complexity to the subterranean application. A 75/25 o/w emulsion was prepared in accordance with the following procedure. First, 2 grams (g) of an orthoester-based surfactant in accordance with Formula I (R1=octadecyl, R2=MPEG-350, and R3=CH3) were dissolved in 50 milliliters (mL) of a solution comprising 0.05% sodium hydroxide by weight of the solution. To the resulting solution, 150 mL of mineral oil (HDF-2000) were added while shearing in a blender to form an o/w emulsion. The rheology of the o/w emulsion prepared in accordance with the above procedure was measured on a FANN®35 viscometer fitted with a yield stress adapter. Yield stress adapters are described in U.S. Pat. No. 6,874,353, the relevant disclosure of which is incorporated herein by reference. Data analysis was done with the Casson model to determine that: yield stress=13 Pascals; infinite shear rate viscosity=97 centipoise; and r2=0.99, wherein r is the correlation coefficient. A 75/25 w/o emulsion was prepared in accordance with the following procedure. First, 4 g of an orthoester-based surfactant in accordance with Formula I (R1=butyl capped PPO-2500, R2=MPEG-350, and R3=CH3) were dissolved in 50 mL of a mineral oil (HDF-2000) containing 10% of ACCOLADE™ drilling fluid base oil by volume. ACCOLADE™ drilling fluid base oil is commercially available from Halliburton Energy Services, Inc., Duncan Okalahoma. To the resulting solution, 150 mL of water were added while shearing in a blender to form a w/o emulsion. The rheology of the w/o emulsion prepared in accordance with the above procedure was measured on a FANN® 35 viscometer fitted with a yield stress adapter. Yield stress adapters are described in U.S. Pat. No. 6,874,353, the relevant disclosure of which is incorporated herein by reference. Data analysis was done with the Casson model to determine that: yield stress=40 Pascals; infinite shear rate viscosity=153 centipoise; and r2=0.99, wherein r is the correlation coefficient. 2. The method of claim 1 wherein the treatment fluid is an emulsion having pH of about 8.5 or greater. 3. The method of claim 1 wherein the base fluid is selected from the group consisting of: an aqueous fluid, an oleaginous fluid, and combinations thereof. 4. The method of claim 1 wherein the orthoester-based surfactant is an emulsifying agent, a non-emulsifying agent, a foaming agent, a defoaming agent, a dispersant, a wetting agent, or a combination thereof. 5. The method of claim 1 wherein the orthoester-based surfactant is synthesized from a diketene acetal or a multiketene acetal by the addition of a hydrophobic alcohol and a hydrophilic alcohol. 7. 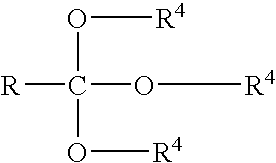 The method of claim 1 wherein the orthoester-based surfactant contains a tertiary amine. 8. The method of claim 1 wherein the orthoester-based surfactant is present in the treatment fluid in an amount in the range of from about 0.01% to about 5% by weight of the treatment fluid. reducing the pH of the treatment fluid so as to facilitate degradation of at least a portion of the orthoester-based surfactant. contacting the treatment fluid with an acid. 11. The method of claim 1 wherein the treatment fluid is introduced into the subterranean formation at or above a pressure sufficient to create or enhance one or more fractures in the subterranean formation. drilling at least a portion of a well bore penetrating the subterranean formation using the treatment fluid. introducing the emulsified treatment fluid into a subterranean formation. 14. The method claim 13 wherein the emulsified treatment fluid further comprises gravel particulates, and wherein the method further comprises depositing at least a portion of the gravel particulates within or adjacent to a portion of the subterranean formation to form a gravel pack. reducing the pH of the aqueous phase so as to facilitate degradation of at least a portion of the orthoester-based surfactant, thereby facilitating separation of the oleaginous phase and the aqueous phase. introducing the emulsified treatment fluid into the subterranean formation at or above a pressure sufficient to create or enhance one or more fractures in the subterranean formation. 18. The method of claim 17 wherein the oleaginous phase comprises a heavy oil. International Search Report for Application No. GB06182125 dated Jan. 2, 2007. Office Action for U.S. Appl. No. 11/232,687, dated Mar. 24, 2009. Office Action mailed Sep. 15, 2008 for U.S. Appl. No. 11/232,687. Todd, et al., A Chemcial "Trigger" Useful for Oilfield Applications, Society of Petroleum Engineers, Inc., SPE 92709.